Sidewalk Tango and Enid Blyton’s “The Magic Faraway Tree”. I step through the tall carved doors of the Tiki Lounge in Swan Street Richmond, opposite the expensive car dealers and between a bolt warehouse and a chef’s clothing outlet. The entrance is crowded with the footpath tables and paraphernalia which go out later. 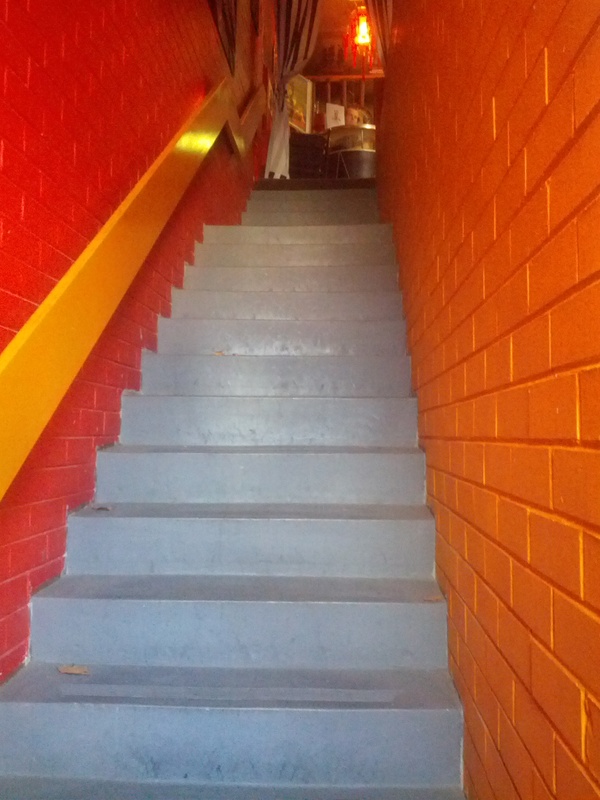 I climb a straight flight of industrial concrete steps towards a little fifties vinyl and laminex bar at the head of the stairs. This is the reception desk. Sometimes I hear only our steps then gradually David’s voice comes in, quietly explaining something to the Beginner’s class. Sometimes the music is on and we rise into it. Depending on the time of day, it might be the end of the 7 pm Beginners class or if it’s a Sunday afternoon, the music of the Practica. Then again, on the first Friday night of the month, it will be Milonga music and a whole different atmosphere. One evening, I had a sudden memory of Enid Blyton’s Magic Faraway Tree in the Enchanted Wood. The children would run excitedly through the woods and climb the tree, passing the strange inhabitants on the way up. Then at the very top, a ladder reached upwards through swirling cloud. The children seemed to find this ladder totally irresistible, because at the top, they climbed into a magical land. There they would have adventures before descending to the safety of the tree and then slide right down through the heart of the tree to the ground. It was the feeling of not knowing quite what was going to happen which was what I recognized about our tango experiences. We stepped tentatively across a corner of the dance floor which filled about two thirds of the space. The boards were gleaming in the hot morning light coming through the warehouse windows onto Swan Street. The transparent red draped curtains and matchstick blinds softened the glare. Unusual music was playing through the tall mounted speakers around the room. Other would be dancers hovered in the Tiki Bar lounge. The décor was an eccentric mix of Pacific Island meets retro suburban couches, chairs and coffee tables. We made polite conversation and those who had proper shoes (ie leather soled – mine weren’t) changed into them. David called us on to the dance floor and introduced himself and Di . The two of them are Sidewalk Tango. He explained the music as Golden Era Tango Music from Buenos Aires, introduced us to the beat and started us walking in time around the room. Thus began my introduction to the mysteries and difficulties of the tango walk. By the end of that day, we had walked, learnt the embrace, learnt and forgotten a whole lot of new Spanish terms for steps, learnt and forgotten a whole lot of new peoples’ names, learnt how different each partner felt, realized how nice it was to change partners around the line of dance and learnt some basic ochos, in three separate sessions. We had been served lunch and afternoon tea. It was exciting and bewildering and we descended the stairs into the end of a hot Saturday wondering how on earth we would manage the same again next day. However, we did; just! It was a terrific introduction into both the dance and the friendly, quirky, professional atmosphere. So began a long period of entering the world of the Beginner’s class on Wednesday night. Now we climbed the stairs at the end of a working day and met a different group. Quite a few from the Workshop but others who had been learning for quite a while but still valued the basics taught in this class. We learnt the ritual of the shoe changing and the piling up of the shoe bags under the tables and beside the couches. I still felt anxious about ‘being able to do it’. Mostly I got along not too badly but some steps defeated me completely- the Lady’s Basic for instance. Somehow, in that step, the connection between brain and body vanished. However, I loved being in such a group of mixed ages and sizes and abilities- and men! Since I’d left teaching it just came to be that I moved in circles that were predominantly women. I missed the company of men with their good humour and jokiness. I was astonished to dance with men younger than my son and men as old as my father was when he died. I valued being accepted as just another person wanting to learn this complex and exciting style of dance. This land at the top of the stairs was not entirely comfortable. I was often tired after a day’s work in my ceramics studio. I was aware that my legs were not as strong as they could be and still felt a bit self conscious. I tried really hard till sometimes my brain was fizzing and it was quite often a relief to head down the stairs and home. At least, compared to the lands at the top of the Faraway Tree, the stairs were always there! As an adult, rereading the story, I found it horrifying that the clouds could close up and hide the children’s exit to their world. It was strange that this hadn’t bothered me much at all as a child reader and it just seemed another exciting part of the story. They always did find their way home, once with the help of a little aeroplane which they climbed into and in which the boy, of course, flew them off the edge of the cloud and down to safety. The world of the Sunday afternoon Practica has changed a lot since we first started. It took quite a few months before we felt brave enough to leave the security of our Beginners’ class and face a new experience with this thing called a Practica. We had been told it was a time where we could practise what we’d been learning in class and that a couple of the assistants then, Maeva and Bruce, would be there to help. So, one Sunday afternoon we entered the studio to find a whole of people we had never seen before and they were dancing tango like we felt we would never be able to do. They moved around the floor in the afternoon light, some dressed elegantly, women all in high, high heels and some men in the rather baggy forties trousers which I have come to realize is a style associated with the forties Golden Era Music and tango . Other men were in jeans and tee shirts, in fact it was the like the usual mixed bunch of our class, only different and much more accomplished. This was all a bit intimidating. However, we plunged in and it was good to have Bruce and Maeva to help us remember and refine our steps from Wednesday night. We didn’t know enough to be able move around the floor continuously and at that stage the practicas were a bit of a duty. They gradually became a pleasure as we improved and became friendlier with the group. I liked coming up the stairs to see who was there. People brought cakes and there was coffee- it was friendly and low key and gradually the dancing became easier and I became more confident dancing with people who weren’t Nick. One Sunday, we had dogs up there! Someone had organized a fundraiser for the campaign against puppy farming and we were welcome to bring our dogs. Di was there with her dog and husband and we had just missed Tom and his rescued greyhound. Apart from dogs there is the roof top BBQ. It is very strange to come along in our dressy clothes, once to a Melbourne Cup Milonga and recently an Australia Day Milonga to see an insubstantial red painter’s ladder under an open window leading on to the roof at the back. Even stranger to see David, elegantly suited, descending with a plate of barbequed chicken in one hand for our lunch/afternoon tea/supper. There are a couple of gas barbeques permanently up there under the eaves silhouetted through the matchstick blinds -if you happen to look. The sense of fantasy is always there. We’ve become aware that David and Di are show people and entertainers and really enjoy events and performances. Last year’s end of year Milonga was Circus themed and the whole studio was set up with a circus theme decorations. We’d been asked to dress ‘Night Circus’ or, at the least, elegant tango. The fantasy disappears in the Land of the Private Lesson. We had become comfortable enough after a couple of years to think that a couple of private lessons might quickly smooth out some rough edges and move us along a bit. But I was nervous again. It was very, very quiet as we ascended one Thursday morning for a lesson with David. What would it be like to be isolated from the crowd and have all of David’s attention on us? We could hear only our footsteps as we reached floor level. There was David standing at the music console. He waved and came across. His manner was relaxed and easy and we had a bit of chit chat before moving to the dance floor. I forget what we did, but once we started it was alright and I just enjoyed the learning and the attention. During the class, Di arrived in a flurry of energy and after setting up a cup of tea for herself came across to partner and help Nick for a while. It was terrific. The atmosphere was quiet and friendly with a real emphasis on learning. Nowadays, I’m always a bit reluctant to leave that upstairs world and descend to street level. I realize that now the difference between our tango world and the Faraway Tree world is that the children are nearly always relieved to escape from something a bit uncomfortable, if not frightening, and they are anxious to get home. I leave a transformed world. The physical change of level lifts me to a realm where lights, music and the décor take me somewhere else. I’m helped to move from the world of familiar and often pedestrian routine to a time of movement, engagement and, at the same time, disengagement of my brain. It can become a meditation with my body and brain which is both calming and exhilarating. I am isolated with myself and another and the music. It can feel like being in the eye of a storm and at the centre of the universe. Nothing else matters and I am truly in a Faraway world. This entry was posted in Tango and tagged Enid Blyton, learning tango, milongas, Sidewalk Tango, Tango, The Magic Faraway Tree by lizlow2014. Bookmark the permalink.